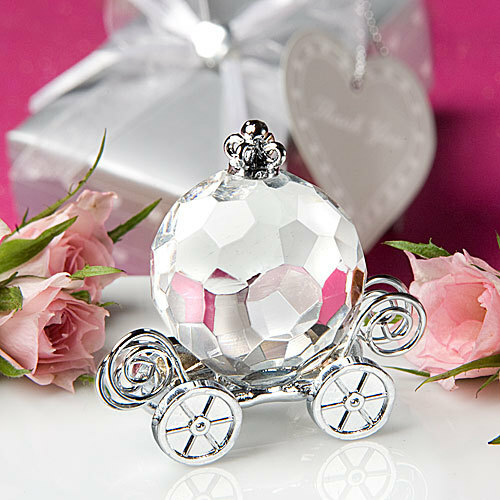 Whether you're theme is "Cinderella", "Fairy Tale" or "Once Upon A time, these exquisite favors really enhance the Cinderella charm. Each measures 1.5" x 1.5" and features a stunning multifaceted clear crystal pumpkin coach majestically perched on silver metal wheels and carriage. Sure to enchant your guests long before the clock strikes midnight, these favors make for a stunning presentation inside a Choice Crystal signature silver box decorated with white hearts, wrapped with a white organza and satin bow with a crystal heart accent on top and an attached heart shaped, matching design "For You" tag. Due to postal regulations, we are unable to ship this item to CA. Please allow up to 5 business days to fulfill your order; then add ship time from NY.